OpenMesh: Where do I find a list of all member functions ? The following picture shows the (simplified) conceptual inheritance diagram for the OpenMesh classes. The basis for all meshes is the corresponding MeshKernel, taking care of the internal storage of the mesh items (vertices, (half-)edges, faces). This kernel is inherited by the PolyMeshT, i.e. the general polygonal mesh, adding higher level functionality. 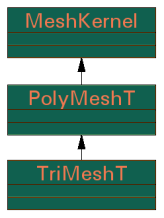 For specialization purposes the class TriMeshT is derived from PolyMeshT and overrides some member functions or adds functions only suitable for pure triangle meshes. The specialized triangle mesh (if you use a TriMesh instead of a PolyMesh).